DAEJEON -- It doesn’t get much better than a cool beer in the heat of the Korean summer. Maybe unless it’s brewed right in your city, just up the hill. Overlooking the Geum River, the Ranch Brewing Co. is Daejeon’s only microbrewery. It started producing craft beers in June. Manned by three people who are all proud to call Daejeon home, the company wants its beer to become a local fixture. “We want to increase the quality of (life of) the people of Daejeon by having better local beer. I believe local beer is always better,” said Frederic Huyssen, the French founder of the new microbrewery. The Ranch Brewing Co. is an offshoot of the Ranch Pub, a craft beer pub that Huyssen and his wife have owned and run since 2007. The microbrewery is a joint effort between Huyssen, former Ranch Pub regular-turned-business partner Lee Jae-hyung, and Brazilian quality-control manager Thiago Mocelin Carvalho. Unlike many breweries, the Ranch does not use software in its processes, a common trade practice that automates the calculation of factors like color and bitterness. Instead, Huyssen prefers to use manual experimentation to produce his beers, which perhaps stems from his tertiary education background of physics and engineering. “It takes the fun out of brewing. I don’t rely on a computer to tell me what I’m doing is right or wrong. I’m relying on real, raw numbers that I can actually see,” he said. The result is three beers: Dye Job, a blonde ale that is a tribute to Huyssen’s hometown of Versailles; Sand Castle, a hoppy, golden ale ideal for summer; and Saison de Seigle, a fruity, spicy Saison. The brewery plans to release another three beers but in the meantime, the first three are already on tap at two pubs -- Neighbourhood in Seoul and Gangneung’s Golondrina -- as well as the Ranch Pub. As regulations and taxes on brewing equipment and ingredients slowly relax, it has become easier for microbreweries to enter the Korean beer market. In 2011, the production capacity to qualify for a beer production license was reduced to 150,000 liters, down from the previous 2.77 million liters. Since 2015, microbrewery products have been allowed to be distributed through means other than the maker brewpub, such as restaurants. With the playing field now friendlier to small businesses, Huyssen wants more learning resources to be available for home brewers wishing to professionalize their hobby. He thinks Korea could follow in the footsteps of American and British universities by offering brewing and distillery courses at the tertiary education level. “I think it is time to create a two-year university program pertaining to brewing. We need qualified staff to make better beers,” he said. And with events such as the Daejeon Craft Beer and Music Festival enjoying growing popularity, Huyssen says local authorities might find it worthwhile to consider the impact of beer on local tourism and industry. “I think microbreweries represent cities. Many people now participate in beer tourism. In many European cities, many people go to places just to try the beer,” he said. More than its business ambitions, Ranch Brewing Co. is adamant in its commitment to community and wants to prove that local really is best. A crowd as diverse as the trio enjoys its beers -- young and old, expats and Koreans. 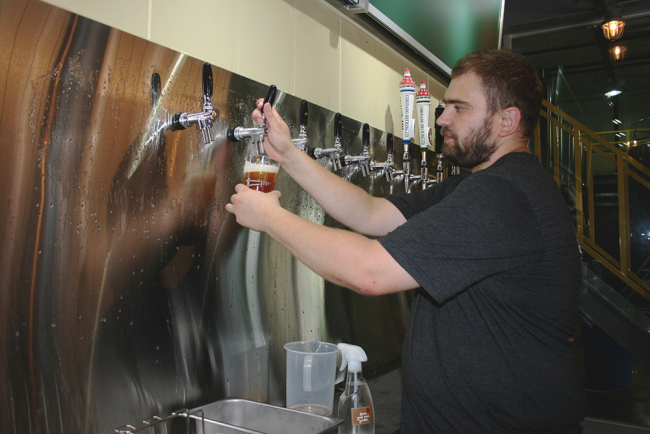 Huyssen hopes that his craft beer can help them feel just as at home as he does in Daejeon.